Just to be clear, mahi mahi is called dolphin-fish, but it is *not* dolphin! It is also called Dorado, and is a very sleek, open-water fish. It is a mild white fish that holds its texture well, yet is still pretty juicy and can be almost buttery. Environmentally, mahi is a fairly good choice, ideally if it is caught in the Atlantic, and by troll or line-catch. Pacifi mahi is also OK, again by troll or line-catch methods. Mahi mahi fillet, skinless if possible. Mix all ingredients except the fish. Drop the mahi into the marinade and let it sit for about 10 minutes. Grill, turning once. 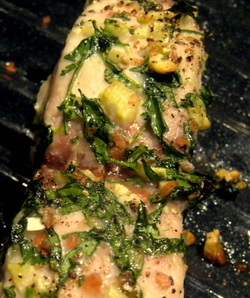 You can also use fillet with skins and bake if it's too cold outside. The photo is the baked version.